The package is very handsomely presented, with two boxes holding the various cables, manuals and other goodies in the package. ABIT include a large sticker with the main connections and jumpers of the motherboard labelled, which is a handy thing to stick to the inside of your case for quick reference. This motherboard boasts an impressive array of features, not the least of which is ABIT's famous SoftMenu III BIOS for overclocking and tweaking pretty much every aspect of the board. The onboard sound of the NF7-S v2.0 was strongly praised, using the nForce2's SoundStorm with Realtek's ALC650 codec chip. 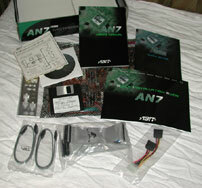 The AN7 goes one better by using the drop-in replacement ALC658, which allows for an optical digital input. This is the second optical connector on the ATX backplate and together they replace the second serial port. I doubt many people will miss a serial port, but then again, I'm not sure how many will use an optical digital input. There are other improvements to the ALC658 which should keep the audiophiles happy about the AN7's onboard sound - there's more info here on Realtek's site. Also added to the backplate for the AN7 are two more USB2 ports for a total of four, all coming from the nForce. More USB2 ports are always welcome, with the huge range of USB2 devices becoming available over the last year. The NF7-S provided these two extra ports on a separate PCI backplate, but they're tidier on the ATX backplate. Two more are available on both motherboards, but neither provide a cable for them. Firewire isn't neglected either, with a backplate port appearing on the AN7 and another on the motherboard, but no cable provided for it. 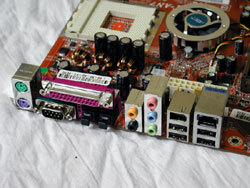 The NF7-S v2.0 had two ports provided on a PCI backplate. Two SATA ports are provided by the Sil3112 controller on both motherboards and they can be RAIDed together or used individually. Realtek onboard Ethernet is provided via the ATX backplate on both motherboards. When you look at the box and bundle with this motherboard, you could be forgiven for not realising you are getting a motherboard at all. On the top of the box, the phrases "A 2nd Processor for Interactive Management" and "Do you µGuru? 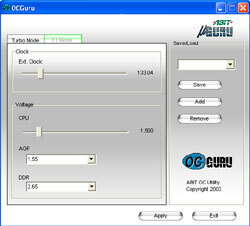 On The Fly Overclocking / The First Integrated e-service" are prominent. 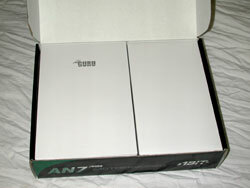 The µGuru chip is the dominant feature in the box art. The actual name of the motherboard appears only in the corner, and even that has the word µGuru stuck to the end of it. In fact, the word µGuru appears no less than 9 times around the box, not including the back panel, which is almost entirely devoted to explaining the µGuru features. When you first open the box, the only word you can see on the packaging inside is "µGuru". Clearly, µGuru (pronounced "micro guru") is a Big Thing for ABIT. But what IS it? This is a hardware monitoring function, as seen on most modern motherboards nowadays. 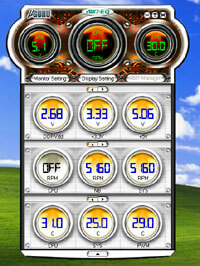 ABIT provide software to display fan speeds, system temperatures and voltages. There are other programs that do similar things, notably Motherboard Monitor, but naturally this ABIT program works out of the box and doesn't need to be configured - sometimes via sheer guesswork - like MBM does. I'm not a big fan of the interface, being extremely large and taking up much of the screen even in 1024x768. Note that in the picture above, the bottom square section can be hidden so only the top rounder section remains onscreen. This is still too large to leave open while you do your work and there doesn't seem to be a way to display the info in the system tray or some other unobtrusive place. Still, ABIT EQ provides nice history graphs for voltages, fan speeds and temperatures and is quite useful. Being able to monitor the NorthBridge fan speed and PWM (power regulation circuitry) temperature are handy features you don't see on many other boards. ABIT EQ can send you an email when certain threshholds are reached, which can alert you to a failing fan or other problem. Overclocking your FSB is possible in Windows, thanks to this utility. Of course, changing the multiplier is not possible here, you must do that in the BIOS. You can also adjust the voltage for AGP, memory and CPU core. It lets you set various presets - perhaps a slower setting for websurfing and email, then change to a faster setting for gaming. I found that moving up in small steps was more successful than rushing up to high speeds immediately, but regardless, I could get higher FSB's in the BIOS than in this program. Again, there are other programs that provide this functionality (SoftFSB for example) but it's nice to see a manufacturer including a program that you know will work with your motherboard. In fact, it's impressive of ABIT to include this kind of thing at all - further evidence of their appreciation of the enthusiast community.